Auburn Rotarians Shawn Asmuth (center) and Walker Jackson (left) spoke to the Auburn Rotary Club about the philanthropic programs of the Rotary Foundation. The international foundation has several areas of focus that it supports both locally and internationally through partnerships with Rotary Clubs. Those areas include peace and conflict prevention/resolution, disease prevention and treatment, water and sanitation, maternal and child health, basic education and literacy, and economic and community development. Pictured with Asmuth and Jackson is club president David Reaves (right). 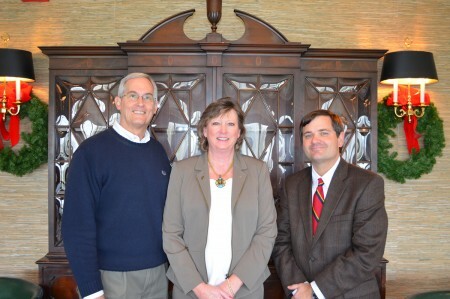 The Auburn Rotary Club welcomed its newest member, Jim Perry (left). Perry, an Auburn resident, directs the Retirement Plan Division for Birmingham-based Chappelle Consulting Group. 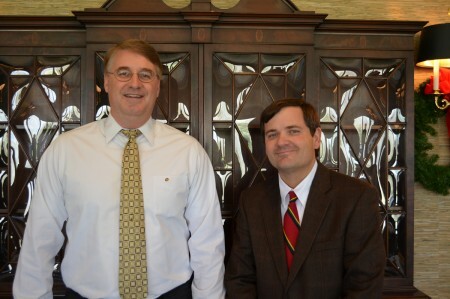 Pictured with Perry is club president David Reaves. For information about joining Rotary, visit https://www.auburnrotaryclub.com.